>> How to Open a Can Without a Can Opener? How to Open a Can Without a Can Opener? In the rise of the industrial revolution, the life of the people got too much busy to cook and enjoy it at home. The idea of takeaway food arose in this circumstance. Canned food is an idea that changed the whole idea of food packing. Normally, before canning wasn’t invented people packed their food only to take it home. But they thought that cooked food could be packed too. But the canning idea changed the scenario. And the world war broke out, canning food was getting its leverage. Militaries around the world started to use canned food as their regular ration. canned food got famous among the civilian also. Pre-cooked food put inside a metal can with edible preservatives. Metal can help to put the can in a fire or microwave. After you heat up the canned food, you need a can opener to open the sealed lid. It’s a matter of seconds to open the can if you have a can opener. But what do you do while you don’t have a can opener? We unveiled some effective technic of opening a can without a can opener. Let not a simple can opener deprive you of a yummy treat! 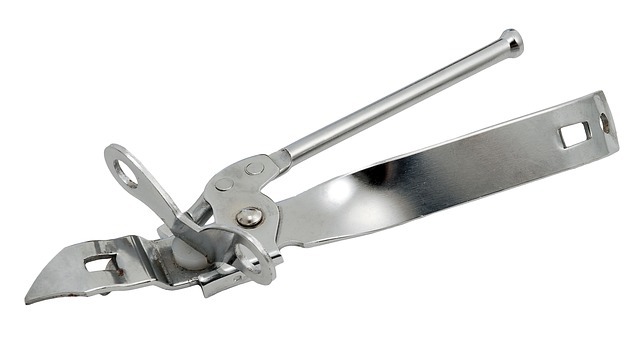 A can opener is the kind of the instrument which you can’t find when you need them most. You take a can full of vegetable soup or you need some oil from a sealed can and you can't find your can opener, what do you do in this situation? Keep searching the can opener or use something to open the can? yes! You can use something else to open a can. let’s have a look. If you have a can with a thinner lid, you can use a spoon to open it. Just put the sharp edge of the spoon on the lid and put some pressure on the spoon. If everything alright, you’ll crack open the lid of the can. A fork is a kitchen utensil that has two or three sharp edges to help you pick the food from the plate. But there is another use of fork and that is it can function as a can opener. Just use the sharp edges to cut open the lid. Use the strong fork for your safety. Generally a knife is used to cut something into pieces. But you can use a knife as a can opener. Just work it around the lid and it will cut open the lid. But be careful with a knife to avoid any unexpected incident. Hand file is used to sharpen something like a knife or handsaw. It has uneven edges which allow it to sharpen the knife or saw. The process of using a hand file can also be used to open a can. probably you’ve noticed that the can has a sealed lid. Metal folding is holding the lid in place. If you remove the metal folding by using a hand file, you can open the lid. We want you to have the food you like. You can use these technics to open a can. But please be careful with these technics.